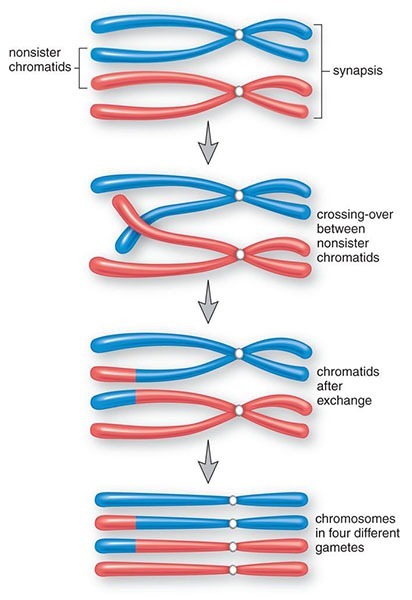 The exchange of segments between non-sister chromatids of homologous chromosomes (Are similar but not Identical) during meiosis is known as crossing over. Linked genes can be separated by crossing over. Two genes closer gene loci are strongly linked. There is greater chance of their separation through crossing over. if the gene lie father apart. Suppose, there is a single pair of homologous chromosome. The homologous chromosomes pair up lengthwise. This is point to point and locus to locus pairing. One homologus carries genes A and B. Another homologue has a and b.
Chiasmata are formed at many places between non-sister chromatids. Crossing over occurs at 4 strand stages between non- sister chromatids. Crossing over can take place at more than one place. Exchange of segments of chromosome means exchange of DNA, i.e. genes or alleles. There are different alleles on the non-sister chromatids. Thus, an exchange of segments causes recombination of genes. Allele b crosses over to homologue containing allele A. Similarly, allele B comes on the homologue of a. Then chiasmata open up during meiosis I and the homologous chromosomes are separated. The sister chromatids also separate from each other during meiosis Il. Each chromatid becomes an independent chromosome. Two gametes have parental combinations of linked genes, i.e. AB and ab. Two with recombination of genes, i.e. Ab and aB. Only two parental types of gametes are formed without crossing over. Parental types of gametes produce parental types of offspring. But recombinant gametes produce recombinant offspring. Linked genes are located on the same chromosomes. So, they do not assort independently. They move together during meiosis and fertilization. Therefore, linked genes should not recombine by the assortments of alleles in fact, recombination between linked genes occurs. (a) The offspring of the testcross did not give 1:1:1:1 phenotypic ratio. This ratio comes if the genes for these two characters were present on different chromosomes and assorted independently. (b) But if the two genes were completely linked then we should observe a 1:1 ratio. The parental phenotypes should be present among the offspring. The actual results are different from both these expectations. Most of the offspring had parental phenotypes. It suggests linkage between the two genes. But about 17% of the flies were recombinants. Thus, the linkage appeared incomplete. Morgan proposed the mechanism of crossing over for these different results. Crossing over breaks the linkage between the two genes. 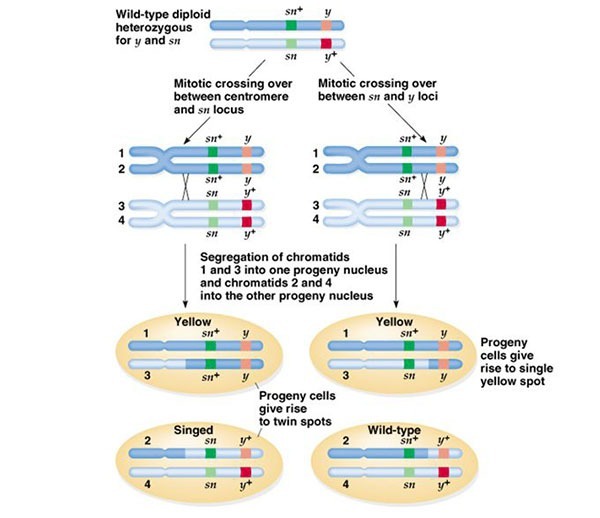 Crossing over occurs when the homologous chromosomes are paired in synapsis during prophase of meiosis I. The non-sister chromatids break at some points and exchange fragments. A cross over between chromatids of homologous chromosomes breaks linkages in the parental chromosomes. It forms the recombinants. 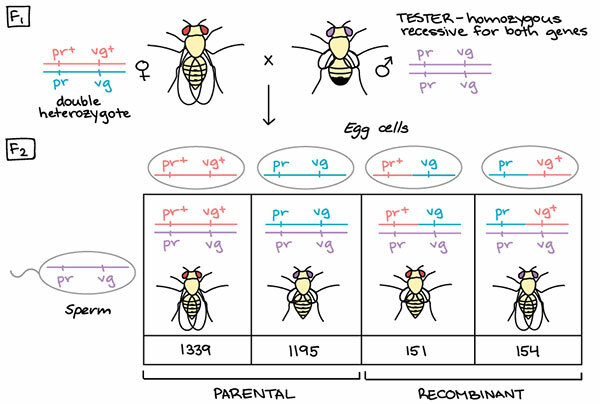 The recombinants bring together alleles in new combinations. The later stages of meiosis distribute the recombinant chromosomes to gametes. Mitotic crossing over is a rare type of genetic recombination. It may occur in some type of somatic cells during mitosis. Mitotic crossing over may occur in organisms that do not have cycle of sexual reproduction. It can only occur in diploid cells and a pair of chromosomes is required for the crossover to occur. The mitotic crossover produces homozygous allele combination in all heterozygous genes located on that chromosome arm. Thus, when a mitotic crossover occurs, genes that were previously recessive are expressed creating a new phenotype. Mitotic crossover occurs in some asexually reproducing fungi. and in human cancer cells.